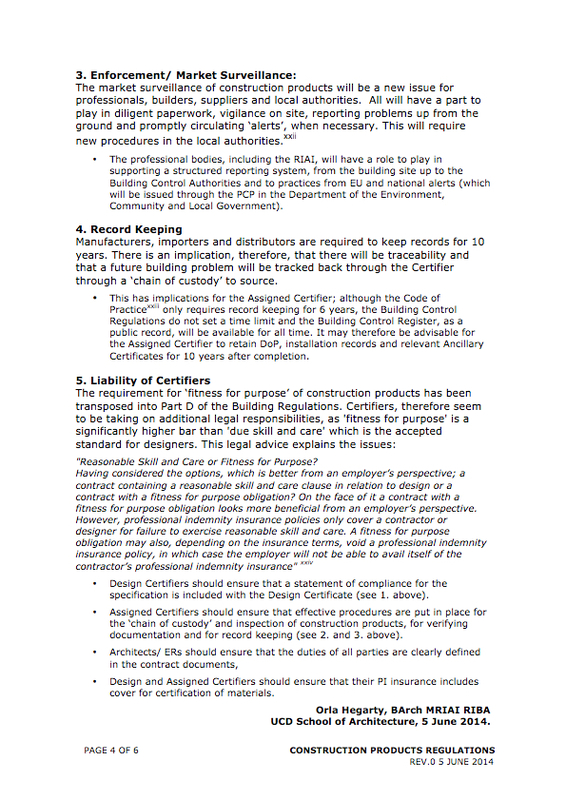 Following the latest concerns about pyrites architect Orla Hegarty has shared this information paper on 10th June 2014. 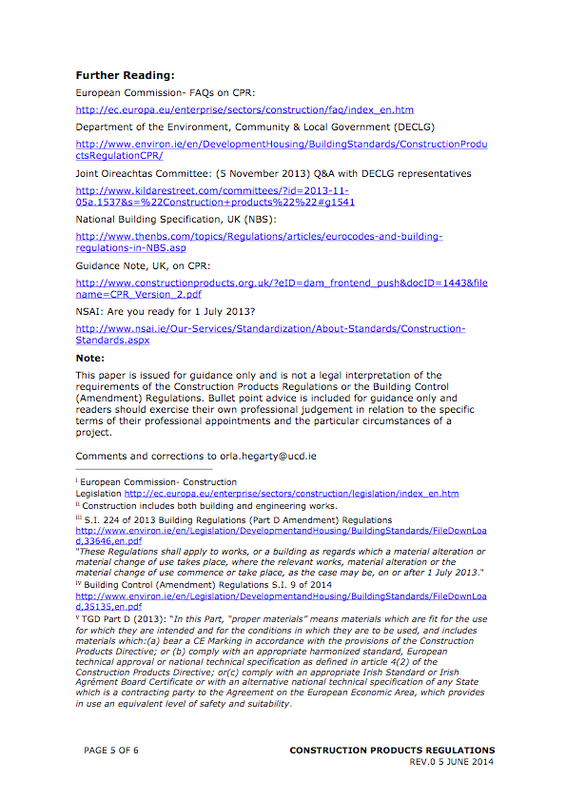 The paper concentrates on the Construction Products Regulations 2013 and the implications for the Building Control (Amendment) Regulations 2014 – an area where much debate and discussion has occurred by professionals. There are implications for all architects, architectural technologists, certifiers and specifiers. 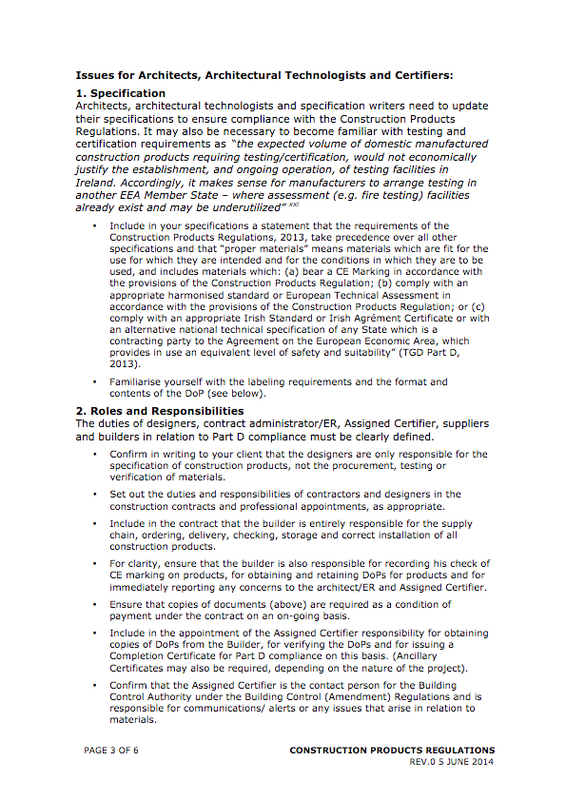 As this regulation has been rolled into Part D of the building regulations compliance for all materials used on site would appear to rest with the Design and Assigned Certifiers rather than the main contractor. 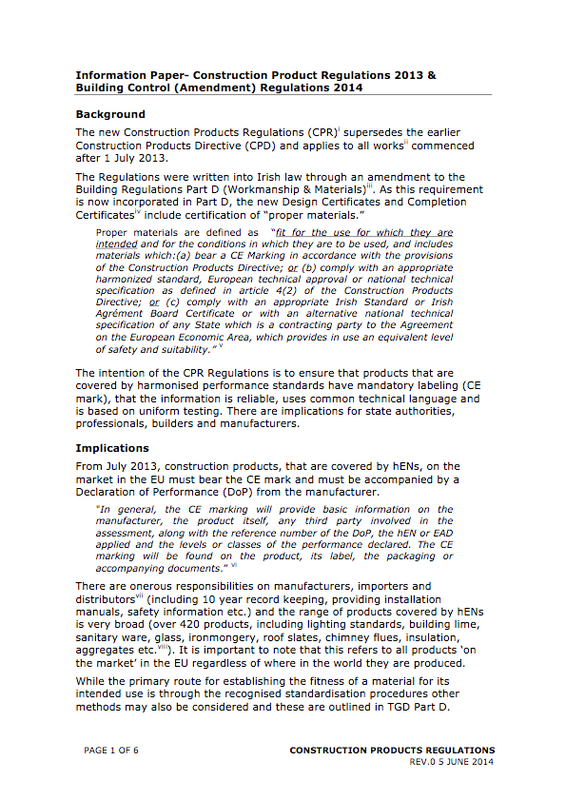 All specifiers and certifiers should make themselves familiar with CPR 2013 and revised part D of the building regulations (links to follow). 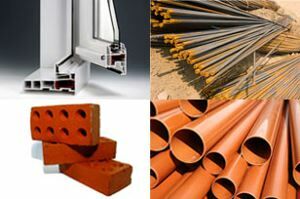 Demonstration of compliance with Part D of the regulations may require a record CE marks and declaration of performance for each and every material/ product used on a construction project. 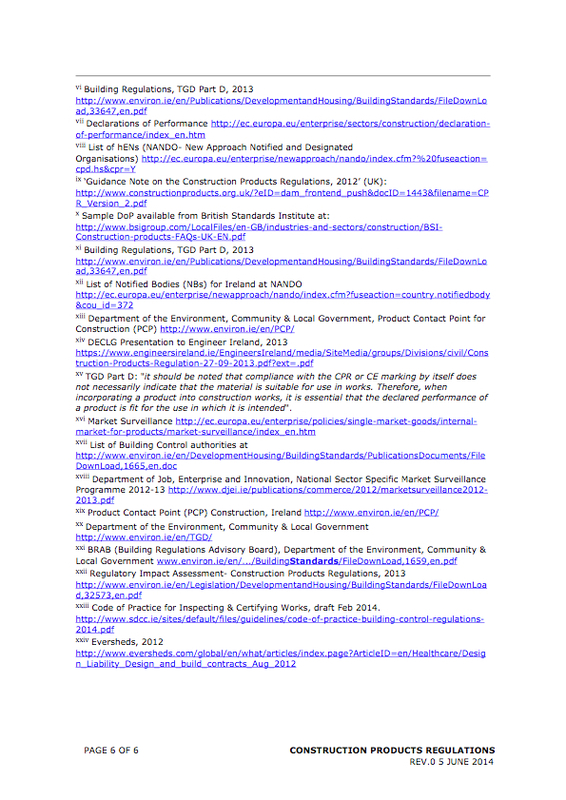 As we can see from recent pyrite issues a materials record should be maintained, even if not initially required as part of completion stage documentation by a Local Authority. Orla Hegarty is Course Director for the Professional Practice programmes in UCD School of Architecture . She is a new member of the 2014 RIAI Council and also a Director of ARAE (Architects Register Admission Examination). The views expressed are her personal opinion and do not purport to speak for University College Dublin, the RIAI Council or the other Directors of ARAE. 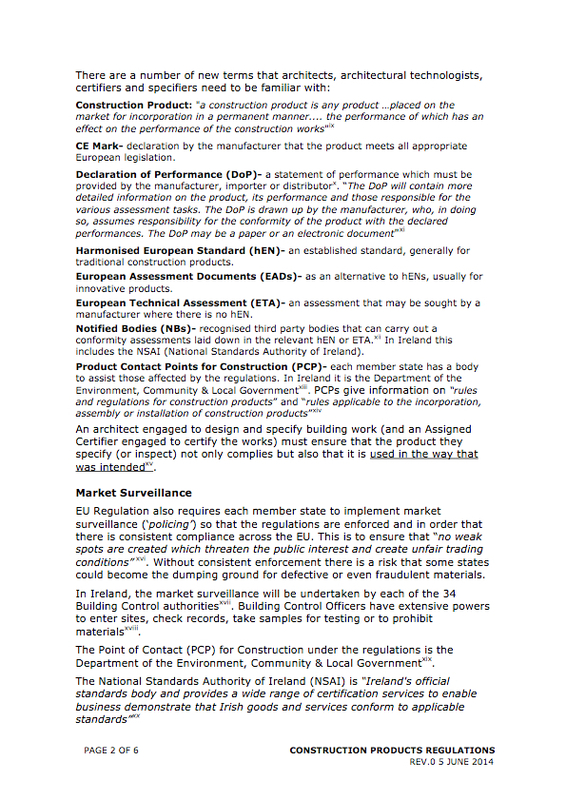 Orla does not claim to be an expert on these regulations (see the disclaimer) and has tried to concentrate on practical advice for architects, technologists and certifiers. Comments and corrections welcome to orla.hegarty@ucd.ie. If you have any comments or concerns regarding information concerned, please either contact the author or your respective representative body for further advice. Great work Orla. Vital reading.